There’s an app for being green, and by an app, I mean a slew of apps. 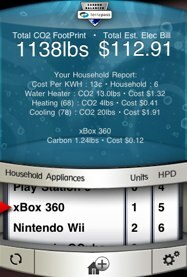 These iPhone apps range from offering general sustainability tips and games to store and product directories. A lot of green apps focus on offering general tips for everyday actions you can take to help make a difference, which really doesn’t take advantage of the iPhone’s capabilities. Below are the top ten green apps across a range of applications, some of which could help you save money in addition to living on the greener side of the fence. 1. If you need ideas for how to be more green, try Green Genie. iTunes ($0.99) The app suggests more than 100 projects to tackle, like bringing your own grocery bags when you go shopping or reducing your company’s paper usage. The app includes a glossary of green terms and has a library of “essential reading” on sustainability. For those who want to dive deeper, it also lists recommended websites and green organizations. Another useful feature of the app is its plastics directory, which helps you understand what the number 5 on your yogurt container means, and why it’s may not be recyclable in your area. Green Genie allows you to submit project ideas, and the database continues to grow as more people pitch in. This is definitely one of the most social, interactive green apps available. 2. GoodGuide iTunes (free) showcases sustainable products and features a bar code scanner to check an item’s environmental impact before buying it. GoodGuide’s mission is to become the best information source for products’ and companies’ environmental, health and social impacts. Its database has more than 70,000 ratings in categories ranging from personal care to toys. If a product catches your eye, you can add it to a shopping list within the app, and if you discover that your favorite deodorant doesn’t live up to your environmental standards, you can make note of that, too. GoodGuide is a TechCrunch50 alum. 3. 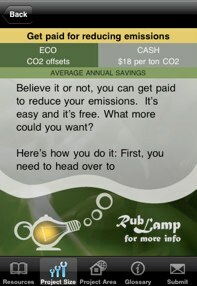 Carbon Tracker iTunes (free) uses GPS to calculate your carbon footprint based on how much your travel. You can chart your carbon emission changes by month and set goals to decrease them. The app factors emission for planes, train and automobiles, as well as a few other vehicles. It also allows you to switch between miles and kilometers, in case you need to emit carbon abroad. 4. 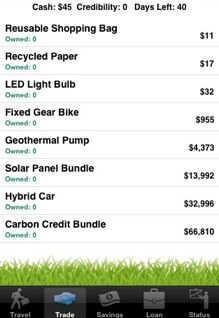 Green Outlet iTunes ($2.99) tries to predict your electric bill and carbon footprint based on what appliances you use. To get started, you find the types of appliances you have (microwave? PlayStation?) and approximate how many hours per day you use each one. The app will estimate your electric bill and carbon footprint for the month. You can also see a breakdown of how much each appliance is costing you. If you exceed the U.S. Government’s recommended carbon limits, the app will warn you and give you the option to purchase carbon offsets. 5. Green Gas Saver iTunes (free) tracks your driving habits and warns you through gauges and sounds if you accelerate too quickly or take a turn too hard. The app saves your score from each trip to help you improve over time. It’s a good way to become a better driver overall, in addition to saving on fuel costs. It uses the accelerometer to detect sharp turns, but if may also GPS to constantly calculate how fast you are going, which could make it a battery hog. 6. 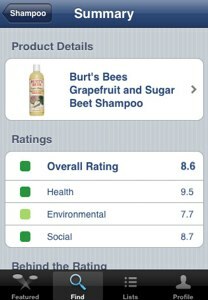 Find Green iTunes (free) points you to nearby sustainable businesses. There are a few apps that focus on local food, but Find Green can also point you to other categories, like wellness, office and landscaping. It also lets you select distance by type of transportation, so you can choose whether to bring groceries home by foot, bike or car. You can also submit green businesses you know of to the database. 7. Get Green iTunes ($0.99) offers relevant green tips by tailoring them to the season. Getting advice on keeping your house draft-free is less relevant in summer, as are gardening tips in winter. Most of the “green tips” apps available offer randomized advice that are often pointless or laughable in the wrong weather. Get Green is the best of the bunch for being smart about the context and timing of the tips it offers. 8. Green Me is designed for list-maker types. It iTunes ($1.99) displays a calendar and asks you to list five “green” things you’ve done each day. The built-in calendar is then marked with a shade of green correlated to how many things you did to be sustainable. The more accomplishments you list, the darker the green for that date. It’s a handy way of tracking how diligent you’ve been over time with a little game mechanics thrown in. 9. Green Charging iTunes ($0.99) makes your phone vibrate and sound an alarm when it’s fully charged to save energy. It also displays how much talk time you have at your current battery level. This app is handy because phones and other devices can use up a significant amount of energy even when they’re no longer charging. Unplugging electronics when you’re not using them is a good green habit to develop, and this app can help you get into it. If you ever goofed off in math class by playing Drug Wars on your graphing calculator, you might enjoy Green Wars iTunes ($1.99, or free for the lite version). It’s a green twist on the classic buy low/sell high game. In the original game, you deal drugs, but in Green Wars your inventory is packed with things like reusable shopping bags and hybrid cars. I know, it’s not as fun, but if you can forgive that it can be an engaging game. Your goal is to buy cheap green products, travel to a different area in the game, and try to sell them at a profit. Loans are available to buy more items, and once you start earning, you can deposit your bounty to start earning interest. It won’t make you more green directly, but it might help you keep those green thoughts front and center. Many other green apps exist that encourage sustainability, but some things still have to be done manually. Separating and taking out the recycling or turning the compost? No, there’s still no app for that.